Bring rustic elegance into your child's bedroom or your guest room with our Real Hickory Log Bunk Beds. A sunburst pattern made from hickory logs can be found on the headboard side of your bunk bed. This rustic bunk bed features heavy kiln dried hickory logs to ensure strength and durability for both children and adults. The thick and rugged hickory bark adds dimension and color contrast to the hickory bunk bed. The sides of this rustic bunk bed feature hard wood rails for sturdy construction. No matter your age you will feel safe and secure climbing up this hand crafted solid bunk bed. A Bunk Board is required for top bunks and strongly recommended for bottom bunks as well. You may choose to use a box spring on the bottom bunk, but you will lose significant headroom. Your hickory bunk bed will be finished with a special finish to ensure the wood is sealed and protected. 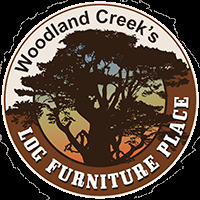 Find more rustic log furniture in the Real Hickory Bedroom Collection. If you need a comfy mattress, we have those too. What is a Bunk Board? A Bunk Board is a wood support that gives the mattress a solid base so box springs aren't necessary, saving precious room. Twin over Twin, Twin over Full, XL Twin over Queen, Full over Full, or Full over Queen.